Don't worry about not knowing "how to do it", or whether you'll like it -- it's easy to learn, yet endlessly challenging and changing. No harm done if you come & decide it's not for you -- and a world of joyful play to gain if it starts your heart singing! October participant response: I was tired before venturing out last night. I am so glad I decided to go! It was energizing, freeing and FUN!! It was so great to sing in a more relaxed, creative way! I shall join in again next time. 2nd Fridays except March, which has been moved because of the flu! at the Upper Valley Music Center, Bach room. People circlesing all over the world in countless different ways and it dates back to the earliest forms of human singing. Under Patricia Norton's guidance, our circle will use techniques developed by Bobby McFerrin, Rhiannon, and the amazing faculty at the Omega Institute circlesinging workshops. It will be different every time, and singers of all levels of experience are included. If you would like to be apprised of circlesing happenings, please let us know. June 2018 circle sing. Photo generously provided by Holly Pierce. 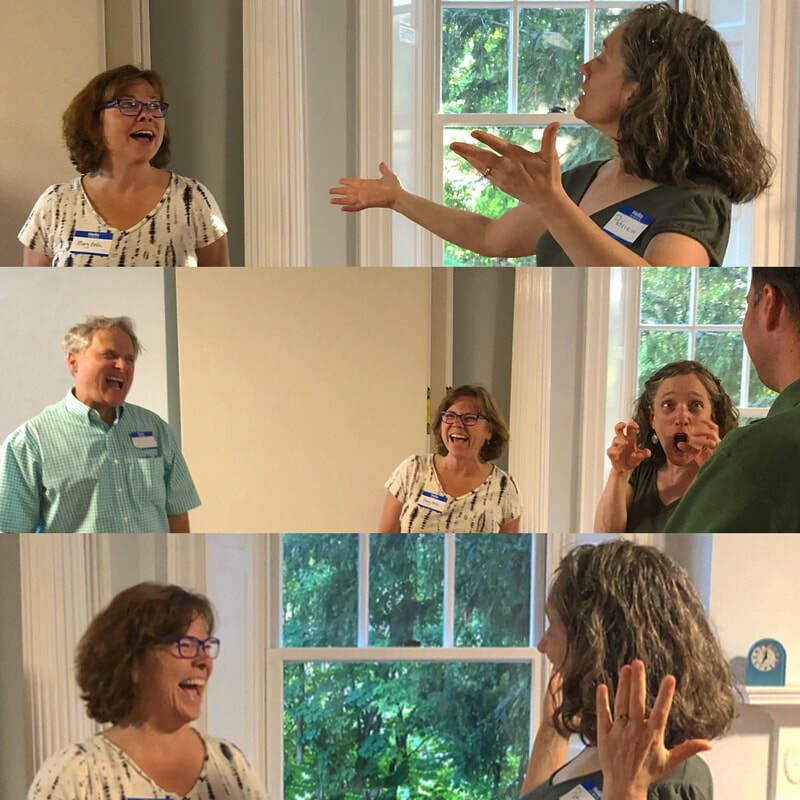 Circlesinging draws on traditions of chant, jazz and gospel improvisation, meditation and mindfulness to create one-of-a-kind choral improvisations. It is accessible to beginning singers, but also challenges and inspires the very experienced. The fundamental building blocks of rhythm, melody, and harmony are used in repeated patterns, creating music unique to the moment. Sometimes the circle invites a solo improviser into the center, sometimes it stays in the meditative pulse of a musical pattern. Circles reflect the people in them -- folk, jazz, African, bluegrass, Mediterranean, South-American, pop, gospel, rock, hip-hop, classical, funk, new-age, Québécois, beat-boxing -- you bring what is in you, no need to label it, and it becomes part of the circle. Several members of that ensemble, perhaps most notably the WeBe3 trio of Rhiannon, Joey Blake, and Dave Worm (Sovoso, Glass House, Oakland Circlesings), kept the tradition going and developed other techniques for improvised choral singing. Together with Bobby McFerrin, Voicestra alumni Judi Donaghy Vinar and Christiane Karam, body percussionist and cooperative practicioner Zuza Gonçalves, and beatboxing artist Tiago Grade (Rizumik) they make up the faculty of a week-long workshop called Circlesongs, held at the Omega Institute in Rhinebeck, NY. Patricia has attended the workshop four times.